This is a very complicated case, Maude. You know, a lotta ins, lotta outs, lotta what-have-yous. And, uh, lotta strands to keep in my head, man. Lotta strands in old Duder's head. Luckily I'm adhering to a pretty strict, uh, drug regimen to keep my mind limber. 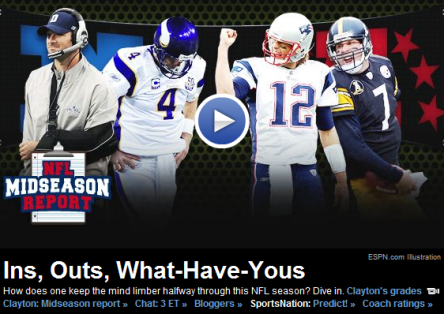 A Big Lebowski-inspired headline (and lead-in sentence) on the ESPN.com home page? Approve. Guess that's what happens when John Clayton gets to write his own material. (Most likely not true. Writers rarely write their own headlines). We will understand if the comments section descends into a quote party. In fact, we will more than understand. We will abide. (Thanks to Stensation for pointing this out).